Chef Jasper Schneider must have quite a long grocery list. As Executive Chef overseeing Le Bistro at Santorini, Tokyo Bay, Italia, Café Mediterraneo and The Beach Grill, his talents have been put to work on a large scale. Chef Jasper Schneider must have quite a long grocery list. 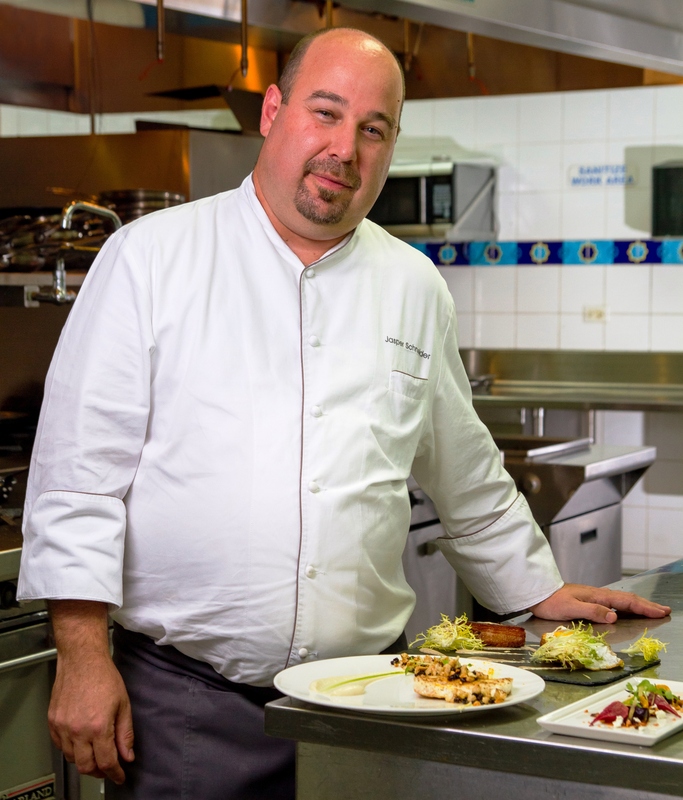 As Executive Chef overseeing Le Bistro at Santorini, Tokyo Bay, Italia, Café Mediterraneo and The Beach Grill, all located on the property of the Cuisinart Resort & Spa in Anguilla, his talents have been put to work on a large scale. I met up with Chef Jasper for the Chef's Table dinner, offered Wednesday nights at Cuisinart, where Jasper cooks, in front of his guests, eight courses of unique local foods and flavors accompanied by four homemade breads and butter from France. I had been slightly intimidated to meet the accomplished Chef Jasper (his impressive resume includes working as a chef at high-end resorts across the United States and as an executive chef in St. Thomas and Turks and Caicos) but I was instantly put at ease by his laid-back and friendly demeanor and easily dived right into getting to know him (and tasting the wonderful concoctions he has created). As he served the first course on the tasting menu, caviar atop a bed of arctic char sashimi with some dill oil (flavored with herbs from the hydroponic farm on Cuisinart's property), we discussed how he got his start as a chef. He first fell in love with cooking when he moved to Hawaii at 18 years old after high school to, as he put it, "go be a towel boy and go to school." Out to lunch with his father, they saw a vacancy sign at a restaurant and his father encouraged him to apply. He got the job and had an instant knack for cooking gourmet cuisine, which was ironic considering his own palate at that age consisted mostly of eggs, pasta and pizza. He ultimately ended up back on the East Coast and, after honing his skills at Nick & Toni's in the Hamptons, attended the French Culinary Institute in New York City. Then, while working in Palm Springs, fellow Chef Eric Ripert opened Azur by Le Bernardin at La Quinta Resort & Club and named Jasper the Chef de Cuisine. In the hot summers when the restaurant was closed, Jasper headed to New York and trained under Eric, who became an important mentor to him. During those summers, he learned how to cook with restrained simplicity. "I learned from Eric that everything should complement the fish and make it the star" Jasper says. He also learned, by example from Eric, about mentoring young cooks, and that it's really about fostering a team. "You need to mentor your team to have one. I have worked in three Caribbean islands and I can tell you about each employee and their family members. Guys that worked for me in St Thomas now own restaurants, and it's nice to see them succeed." Jasper's current home is at Cuisinart in Anguilla which holds a special place in his heart. He has been at Cuisinart since 2013 and is incredibly proud of "creating a great time and getting people to understand my philosophy. Consistency is my biggest accomplishment - that we are consistent in our food." He is also very proud of the hydroponic farm on property which is unique to Cuisinart and allows him to showcase the local flavors in his cuisine. 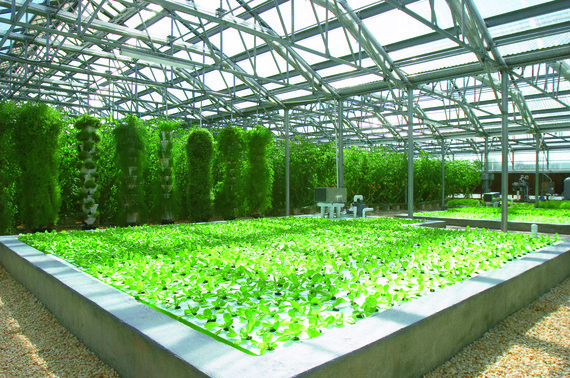 "We grow six different types of tomatoes, peppers, herbs, lettuce, kale, pumpkin, beets, watermelon, and eggplant. We now have papaya trees and passion fruits. And then a great ocean in my backdoor with snapper, Mahi Mahi, and crayfish. You don't get better fish anywhere in the world." 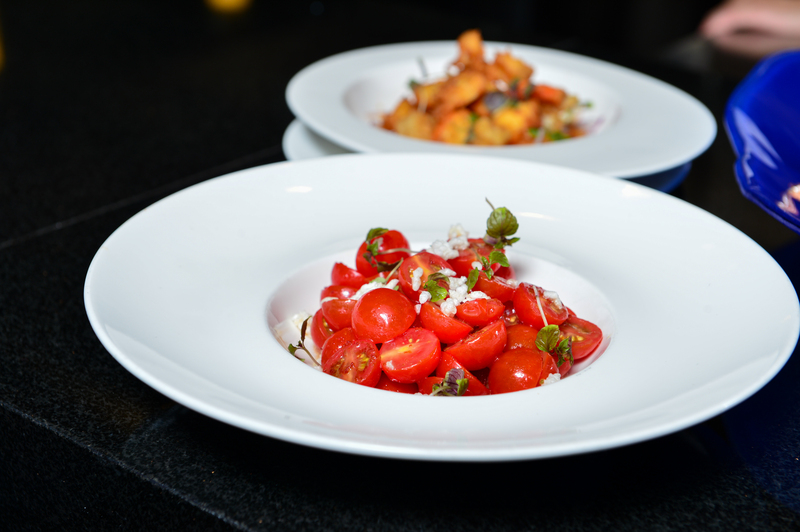 As one would expect, Jasper makes good use of the fresh vegetables throughout the tasting menu, with a stand out being the immaculately plated salad of fresh greens and tomatoes. In addition to interacting with his guests during the weekly Chef's Table dinners, Jasper is present at his restaurants at Cuisinart six nights a week, and loves to come out from behind the kitchen and meet his guests at the various restaurants on property. Jasper has also found a strong food community in Anguilla. He gets together for barbeques with other local chefs and their families, and they discuss food and ways to make their own food better. It's very collaborative; an environment where they want to see each other succeed. As we continue to discuss his culinary journey, course number five, the butter poached crayfish, arrives at the table. Jasper mentions that this is a special dish for him, requiring the most complicated technique to prepare as "crayfish is very delicate and it's difficult to ensure that the fish stays moist and not dry." However, Jasper's personal favorite (as a meat lover himself) is course number eight, the rib eye, which is a perennial crowd favorite and signature dish for Jasper. Juicy and tender and house dry-aged for 28 days; it's in a class of its own. If he has one tip for aspiring chefs, what would that be? "Have passion in what you do. Have an open mind because it won't be easy." The thoughtfulness in that answer is not dissimilar from the thoughtfulness he takes in preparing food that his guests will not only enjoy, but will remember for a long time to come.